When citizens are invited to help define and resolve difficult community issues, they often find better and more sustainable solutions. Our Civic Health Diagnostic Workbook was written to help you evaluate your community’s “civic health”, plan for effective public engagement, monitor and evaluate the effectiveness of your engagement processes, and also identify, benchmark, and share best practices. We have also published several e-books. Download our e-book to evaluate your community’s civic health! You can learn more about the ideas behind the workbook in this series of posts on collaboration or you can contact us today to set up a webinar. Save time, money and frustration and download our e-book to evaluate your community’s civic health! Paperback on Amazon or Barnes & Noble. This publication is a useful tool for governments and their constituents who are about to embark on a major project that will have transformational effects on their communities. In an era of declining public resources, and declining public patience with the ways those resources are being expended, involving citizens in key decision-making processes from beginning to end is strategically and politically warranted. Elected officials and bureaucrats have been notoriously ambivalent about comprehensive and transparent civic engagement, preferring instead the “traditional buy-in” from citizens long after all of the important decisions have been made. Read and Overfelt have designed a set of diagnostic tools that enable the key players to envision, design and implement effective strategies and development plans in a collaborative and systematic manner. They value the “vital role that government institutions have in supporting and sustaining our community life”, but they also stress that governments must reciprocate that trust by sharing the decision-making role with its citizens. I learned early in my first term as Mayor that empowering citizens to take responsibility for the current and future shape of their communities was one of the best tools to turn these communities around. This “diagnostic workbook” should become a part of the toolbox for all communities seeking a more promising future. Columbia, like many university communities, enjoys an especially active and engaged citizenry. We found that encouraging meaningful, civil dialogue among all of our community’s diverse perspectives was one of the most difficult but critical components in our visioning process. This workbook provides a practical tool for both understanding and guiding the process of facilitating meaningful community dialogue. 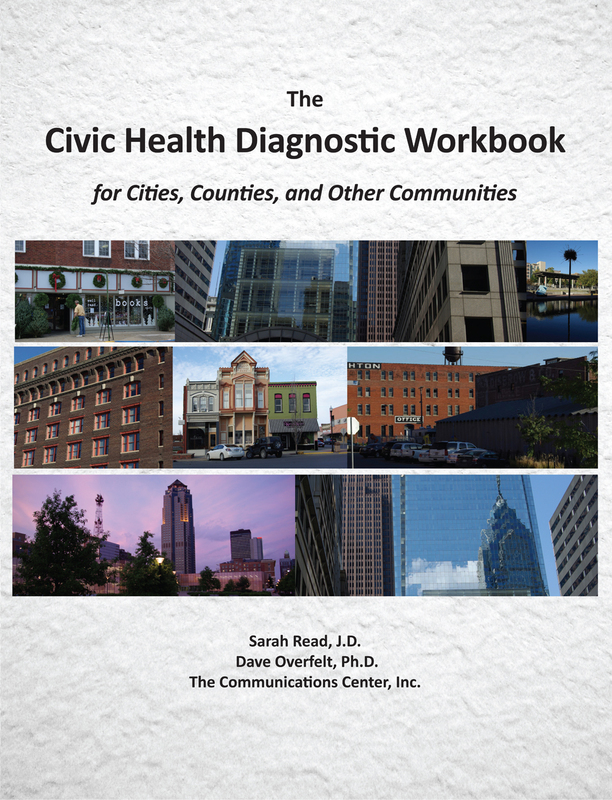 The fact that there are very few tools out there to measure or even recognize civic health gives this workbook an edge. As a more data driven manager I like the calculation process of scoring. Once you walk through the process, it makes sense. All of the calculations leading up to the overall score are fair, neutral, and data-based. If you are embarking on a public dialogue/input process, working through these calculations can be a very helpful way to both identify and minimize civic conflict before hand. It is really very good. Thanks!